French troops fought encircled until all their ammunition was used and led several counter-attacks, the commander of 253.ID, general Kühne, was even captured. The Germans let the defenders parade in the streets after the battle granted them the honors of war to salute their fierce resistance. 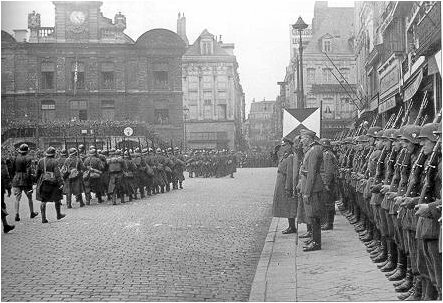 During the height of the Dunkirk evacuation, the 40,000 remaining troops of the French 1st Army holed up in Lille, and fought off a German attack for five days. The Nazis attacked with over 100,000 men and 800 tanks, or more than an 1/8 of their infantry in Dunkirk and nearly one third of their entire tank force in France. During these five days, over 250,000 (of a total of 338,226) troops were evacuated from Dunkirk to England. Though most of BEF’s equipment was lost, this was easily replaced by the Lend-Lease program with the United States. Without these soldiers, Britain would have been virtually defenceless until an entirely new recruit army could be trained, and a much more tempting target for Hitler. Battle of Lille (25-31 May 1940) – 40,000 French troops, remnants of the French First Army, fight against the Germans at Lille in what would become street-to-street fighting, giving the British and rest of the French enough time to escape at Dunkirk. This would certainly be one of the most epic battles of the western Blitzkrieg. `This time it’s the real war; so much the better since at last we can see the end.’ `If you knew how confident and full of hope I am.’27 These two comments come from letters written by soldiers of the 21DI between 11 and 13 May as they headed into Belgium after the German invasion. They should remind us that the soldiers’ demoralization during the Phoney War represented not so much hostility to the war in itself as boredom caused by waiting for a war that never seemed to come. Thus, many soldiers greeted the news of Germany’s invasion of Belgium with relief. The confidence displayed by these soldiers, of course, assumes an ironic hue in the light of what was about to occur, but in fact the story of the French army in 1940 cannot be reduced to the disastrous events on the Meuse. There were many examples where French soldiers, properly armed, properly trained, and properly led, fought just as effectively and courageously as their celebrated poilu forerunners. This was certainly true of the two DLMs of General Prioux’s cavalry at Hannut on the Belgian plain on 13 May (the same moment that the Germans were breaking through at Sedan). This was the first tank battle of the war, and it was won by the French in difficult conditions. There is some dispute as to the exact numbers of tanks arrayed on each side. The most recent French authority claims about 650 German tanks and 320 French, but if the light German tanks (Panzer I and Panzer II) are not included among the German forces, the French enjoyed superiority. Some historians also criticize Prioux for deploying his tanks in too linear a fashion, and displaying insufficient manoeuvrability. But all accounts agree that the French fought well, although the 3rd DLM, which suffered the brunt of the attack, had only recently been formed. Despite the Germans enjoying total air superiority, the French fulfilled their mission (which was of course to act as a decoy, but they could not know that). Once Prioux had fallen back, the task of holding the Germans in the Gembloux gap fell to the newly arrived divisions of the First Army, in particular the First Moroccan Division and the 1st Motorized Division. The former was an only partially motorized unit that had covered 135 km of the journey on foot. The last soldiers only arrived on the morning of 14 May and were still preparing their positions, under enemy air attack, when the German tanks moved against them. Encounter battles of this kind were precisely what Gamelin had wanted to avoid, but for two days the Germans tried to break the line without success. The French held firm thanks to the determined resistance of their infantry and the effective performance of their artillery. This was a rare example of infantry stopping an armoured division in open country, without air support. When the French fell back on 16 May, it was not because they had been beaten but because the Germans had broken through on the Meuse. It would be wrong to assume that, even once the Germans had broken through the three bridgeheads, their advance westwards was simply a mopping up operation. We should not forget, for example, the very fierce resistance of the 3rd DCR and 3rd DIM at Stonne to the south-east of Sedan between 15 and 25 May. Hard fighting was still going on here when the Germans had reached the Channel. 29 Tenacious resistance was also demonstrated by the remnants of the First Army caught in the jaws of the German trap and knowing that the outcome was predestined. In Lille, about 30,000-40,000 soldiers of the First Army held off massively superior German forces between 28 May and 31 May, despite being entirely surrounded and relentlessly bombarded by artillery fire. The Germans had to fight their way through the suburbs while the French held on wherever they could-in factory buildings, apartment blocks, behind improvised barricades- until all ammunition was exhausted. One regimental commander, Lieutenant-Colonel Dutrey, committed suicide rather than surrender. Although they may not have realized it, these soldiers had held off the Germans long enough for the BEF and part of the French army to reach the Dunkirk bridgehead. The bridgehead of Dunkirk itself was defended between 29 May and 4 June by about 8,000 soldiers left over from the 12DIM (one of the divisions of the First Army which had been at Gembloux fifteen days earlier). Their commanding officer, General Janssen, was killed on 2 June. The miracle of Dunkirk, we should remember, was made possible by Gort’s foresight, Hitler’s loss of nerve, British resourcefulness, and French heroism. This entry was posted in Battle, British, France, Germany by MSW. Bookmark the permalink.